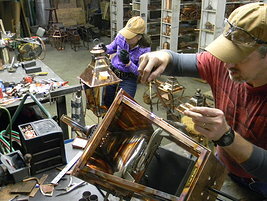 St. James Lights are made from the purest copper in the world. All Light Fixtures are ETL Certified and all Electrical Components are U.L. Certified. Other Materials used are 16, 20 and 32 ounce Copper- only the highest quality! Graceful lines and elegant curves make the and individually hand-crafted excellence in every copper lighting fixture you can find anywhere- guaranteed! The Verrazano Copper Chandelier is a one-of-a-kind design in the copper lighting world! Modern copper chandeliers like the Verrazano features 8 beautifully slim and elegant "arms" which hold each light. This magnificent design style draws the light away from the center of the copper chandelier so it can more easily illuminate the surroundings. Having 16 different finish options available to choose from, like the other St. James lights we carry, it's easy to find the looks you need to complement your decor's themes. By changing finish colors you can create a vintager copper chandelier or an antique copper chandelier. If you like the looks of a gold chandelier, brass chandelier or iron chandelier you can create that too simply by changing the finish color! With its sleek, elegant design and several options in size, the Verrazano copper lighting fixture will complement any décor you may have. Why Choose St. James Lighting?